The MV Agusta Rivale 800 is the quintessence of an Italian motorcycle. Made to be stylish and fun, the radical model leaves out the practicality and brings together a stunning design with high performance your tricilíndrico engine 125 hp of maximum power. Equipped with a cycling group which ensures good maneuverability, the Rivale incorporates unique items and have higher price than most bikes with the same cubic capacity: US$ 15,798. The Rivale is essentially a supermotard: brings elements of a motorcycle without fairing with suspensions of long-haul and 17-inch wheels. 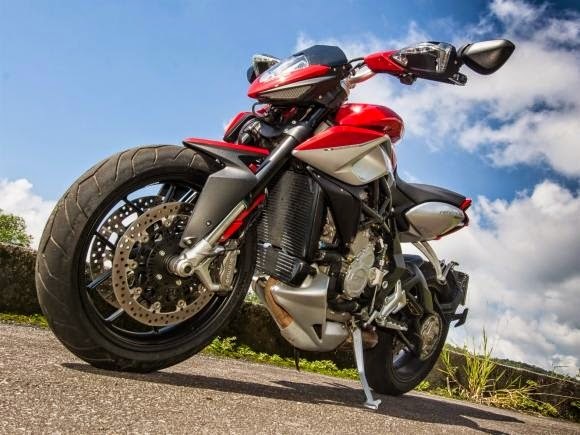 Which results in a whole more attractive and unusual than the Brutale 800, with whom he shares many items, such as the chassis and the engine of 798 cc, but with other supply and exhaust system. Since it was launched in the Hall of Milan 2012, the Rivale 800 has won hearts - so that was voted the most beautiful bike event that year. Of bold headlight diamond-shaped, through the organic lines of the tank to the rounded rear end that seems abruptly, everything in Rivale attracts admired and prying eyes. The design of the supermoto of Varese factory is undoubtedly one of the most innovative of the motorcycle market in the last decade. 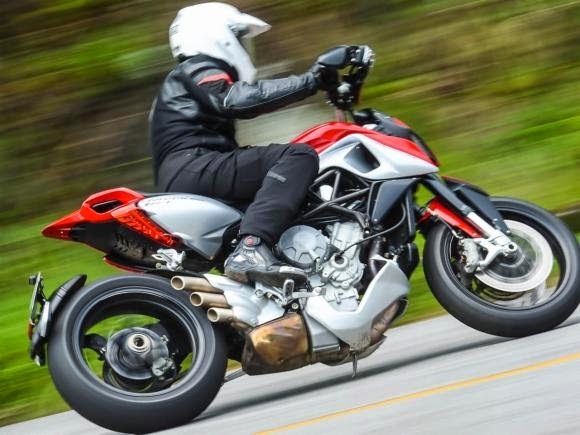 Although daytime lighting lights and turn signals LED, set in the rearview mirror (retractable) which, in turn, also functions as hand guard, are clearly inspired by the old version of the Ducati Hypermotard, the Rivale is loaded with innovations. The rear light assembly is formed by two columns of strategically placed lights on the sides of the tail and integrating flashlight and brake light the rear turn signals are fixed on the rear fender which is near the wheel and serves as board support. Table lattice highlights its Italian origin and the three on the right side exhaust tips betray their engine. The frame uses the same solution with 800 Brutale trellis steel pipes with aluminum sections for fixing the rear Unit swing. At the front, the inverted Marzocchi telescopic fork is fully adjustable and offers 150 mm of travel; at the rear, the monoshock Sachs is also adjustable and provides 130 mm of travel. 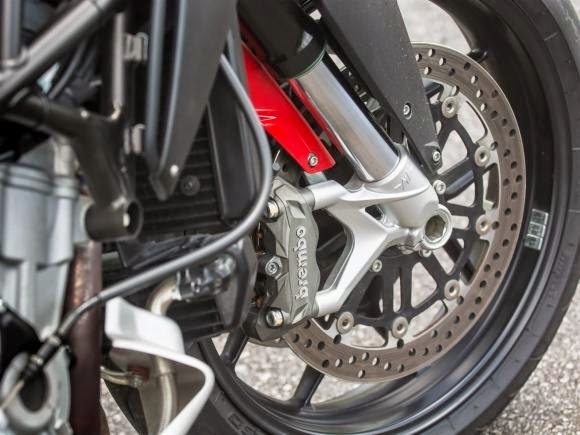 This results in a high bank - to 881 mm from the ground - and a riding position and the supermoto style: while riding in Rivale the rider will "played" in front, with open arms and with good legroom, since the pedals are low. Despite the high bank, the low center of gravity, combined with 178 kg dry weight, make the Rivale is not so hard to "mount" for the lowest pilots. Complete the cycling part of the Rivale 800 two front discs 320 mm in diameter with four-piston calipers and radial fixation of the Brembo brand. At the rear, simple disc 220 mm in diameter, with two caliper pistons. And ending the set, the beautiful 17-inch alloy wheels are shod with Pirelli Scorpion Trail, the measures 120/70 (front) and 180/55 (rear). It's not just the look that MV Agusta Rivale 800 surprises. Its three-cylinder in-line engine, 798 cc capacity, 12-valve DOHC and has an impressive performance: it produces 125 hp of maximum power at incredible 12,000 rpm and maximum torque of 8.6 kgf.m the 8,600 spins. Although not superlative numbers, the way they are delivered is able to imprint a smile on the faces of riders looking for a bike to accelerate in earnest. The tricilíndrico supply system is completely new and is among the best ever made by the Varese factory. 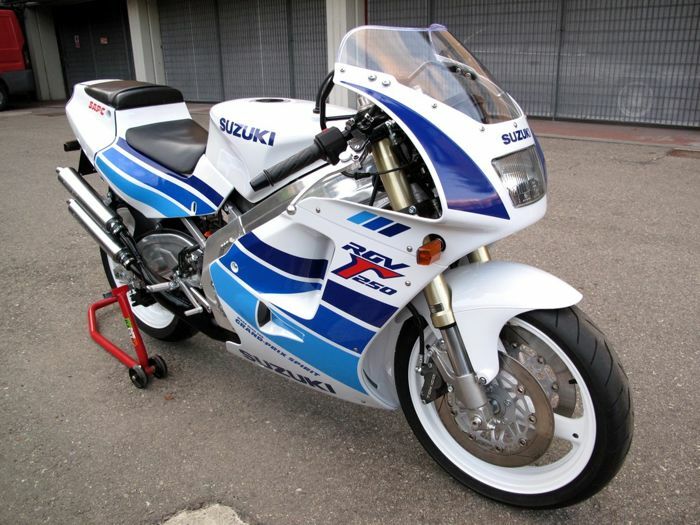 With an electronic throttle, there seems to be accelerating holes and there is enough torque available from as early as 4000 turns - enough to take the front wheel off the ground easily be in first, second or even third gear. The exchange has six-speed tour of the quick-shift, which allows up speed without the aid of the clutch. The Rivale also brings MVICS technology (Motor & Vehicle Integrated Control System), which has three settings for engine management maps throttle response, traction control and ABS brakes. In full, the system is even easier to set up than other models of MV. Each of the driving modes - Normal, Rain, Sport, and there is still a customizable - adjust the throttle response and also the level of traction control. The rain mode, for example, causes the traction control switch to the level "8", the maximum and avoid the rear wheel derrapadas in wet conditions. Believe me, with the motor sports behavior you will need it in the rain. With an excellent cycling, a powerful engine and a design than a little radical, we could only hope that the Rivale 800 was quite fun to ride. And rightly so. This propellant three-cylinder MV Agusta seems endless. Grows so scary turns and emits a roar, which looks more like a nervous howl. Of those that makes you want to take your hand and wrap the cable again just to hear him again. But should dose the momentum on the gas: steep are common and we need to hold on to the handlebar. 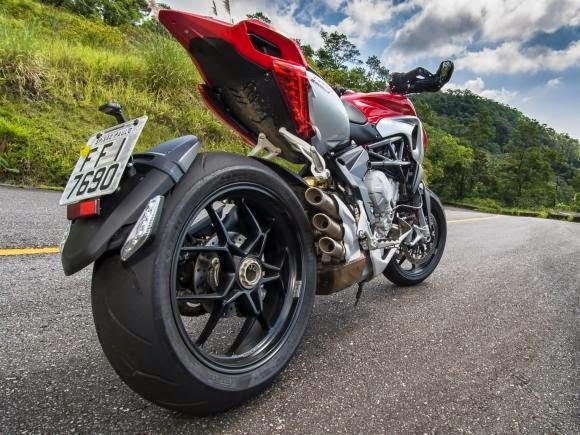 Together with quick-shift, accelerate and climb marches are easy tasks that can lead to Rivale quickly to 200 km / h - MV Agusta says 245 km / h as maximum speed. The performance of the cycling set to attack curves is impeccable. The front axle transmits the confidence to apply the counter-dung in the wide handlebars and around even more elbows locked. And with the advantage of the good course of the suspensions that absorb the floor imperfections without destabilizing the whole. On a winding road, the fun is guaranteed. A curve to another is possible to experience what's more pleasurable in riding a bike: impressive acceleration, after an effective and controllable braking and was just lying to bypass the curve with a pleasant angle. As the head of design, the English Adrian Morton, said at the time of its release abroad, the Rivale 800 is not a bike for everyone. "It was not a request for marketing or to please a particular consumer profile. In MV Agusta, we can still do a draft and produce something unique. The Rivale is not a practical bike. It was made for fun. " After running a few hundred miles to the Rivale 800 can not agree more with the statement of who wrote it. 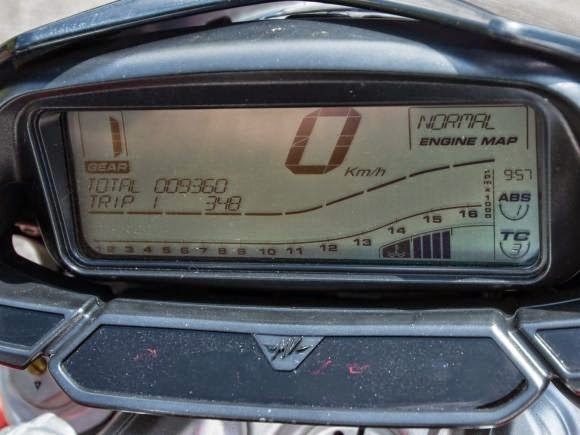 After all, there is no room for luggage; the pillion seat is not the most comfortable; aerodynamic protection is practically nil, even at speeds that can reach Rivale; 12.9 liters and its capacity tank provides an average range of only 188 km - The consumption varied between 13 and 15 km / l. But in appropriate road and with a willing pilot, MV Agusta Rivale can actually be a stylish and unique. The vast majority of motorcyclists feel better in a more versatile and practical bike. But certainly less fun to ride.